It seems like that the humble bubble tea has been around forever. From it's introduction into Vancouver in the 80's (started in Taiwan in the early 80's) to the usual explosion (Vancouver loves fads) in the 90's. At the turn of the century, it seemed to leveling off, but for some reason or another, this "fad" didn't go away. 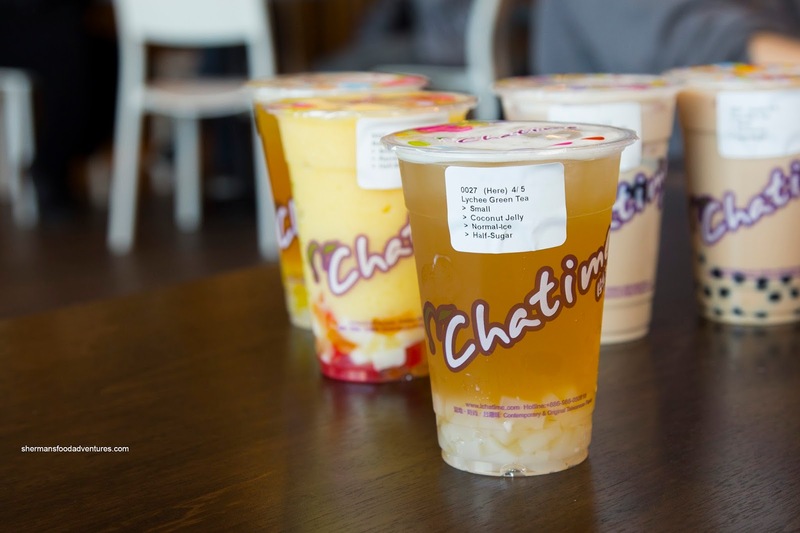 In fact, it branched out and continued growing into markets outside of the usual Asian clientele. 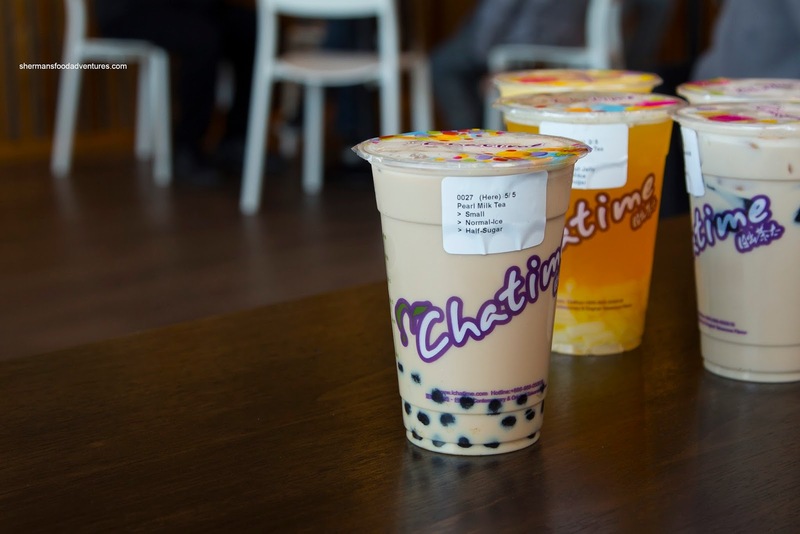 Recently, Chatime has burst onto the scene with seemingly a new location opening up every few months. 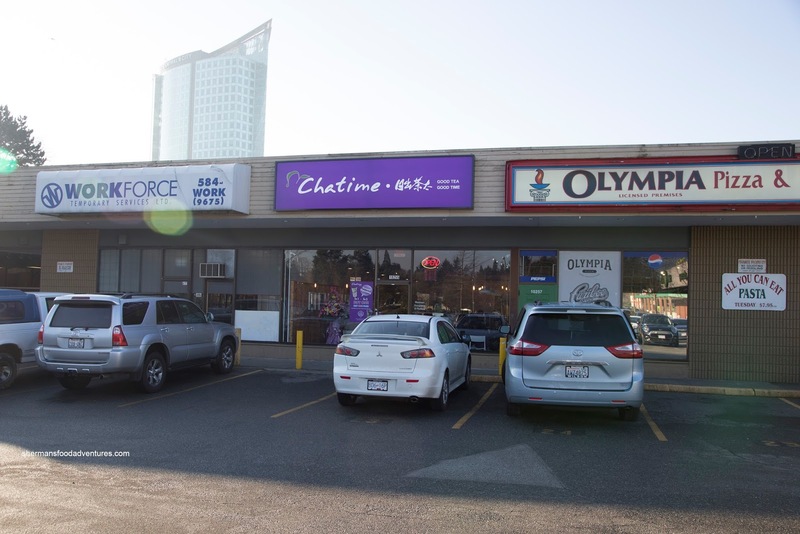 I've visited the Broadway location before and now they have set up shop in the fast-growing and ever-changing Surrey neighbourhood of Whalley. 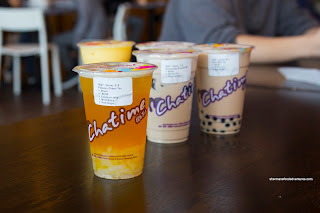 Once again, ChineseBites has partnered up with Chatime and we were invited to sample some of their bevvies. 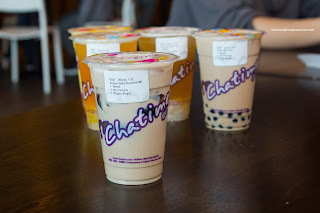 For myself, I had to go with their most popular drink - Roasted Milk Tea with Grass Jelly. I opted for 30% sugar and it was the right call as it allowed the natural flavours to come through. Aromatic with a strong tea presence, the drink was milky (almost creamy) with the background bitterness of the grass jelly. Anything over 50% sugar would've overwhelmed these subtle flavours in my opinion. To test this theory out, I got the Milk Tea with Pearls with 50% sugar. The addition of 20% more sugar was evident, but still allowed the tea flavour to come through as well as the milkiness. As for the pearls, they were on point being chewy while not melting. My daughter was happy as a clam when we told her she could order whatever she wanted (even 2 drinks if she could finish). So she stared with her go-to bevy - Mango Smoothie with Rainbow Jelly. Definitely milky, but still resembling a slush, it was plenty sweet even at 50% sugar. 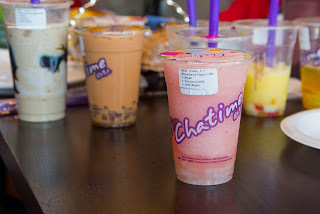 This was partially due to the addition of rainbow jelly (where some of the residual packing syrup mixed into the drink). I think they would be best off naming this a milky slush rather than a smoothie. For her second drink, she had the Strawberry Yogurt with Coconut Jelly, again at 50% sweetness. Now the visuals doesn't cry out yogurt because it was made with yakult rather than the stuff you would find at Safeway. As such, it was more icy than smooth, but still had a refreshing sweet tang. 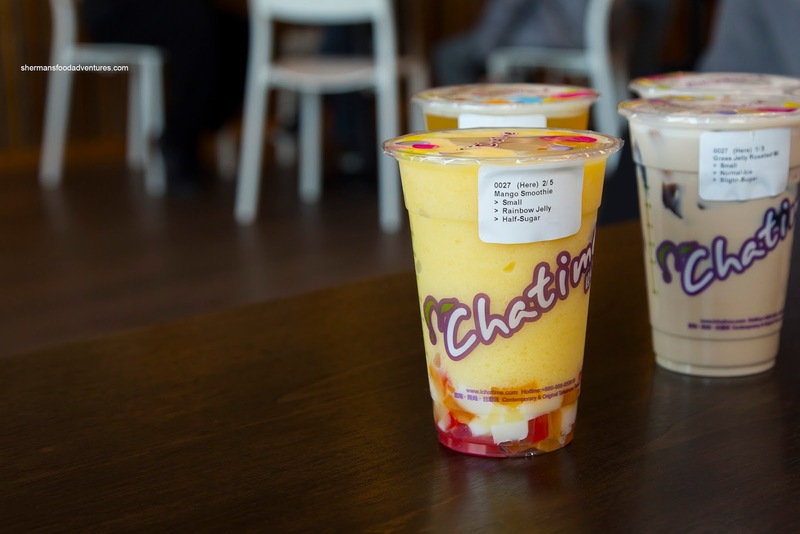 Viv decided to go for 2 similar options including the Passionfruit Green Tea with Coconut Jelly at 50% sugar and Lychee Green Tea with Coconut Jelly also at 50% sugar. By virtue of both being green tea based, the flavours were alike. However, the lychee was a bit sweeter and less tangy. With that being said, whenever there is coconut jelly involved, the drink gets sweeter due to the residual syrup. As we were drinking away, the question came up, "how does Chatime compare to other bubble tea spots in town?". Well, Viv came up with the best answer: it's decent and holds it own, but since there is an actual system regarding sugar and ice content, it makes it easy to customize.